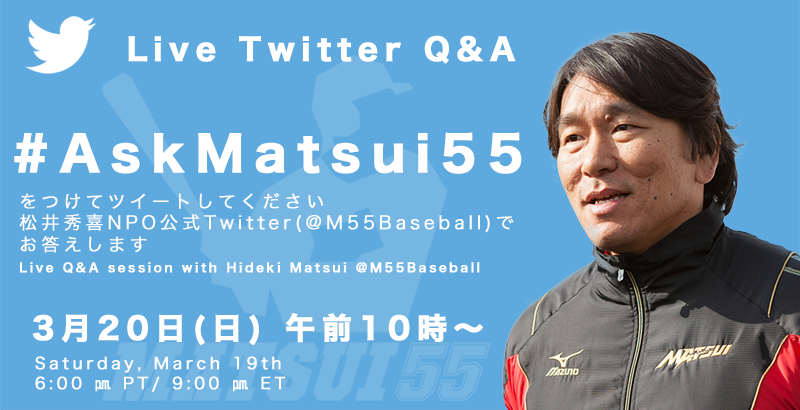 Hideki Matsui hosts Live Twitter Q&A | Press Release | NPO Matsui 55 Baseball Foundation, Inc.
New York, NY – Hideki Matsui will host a live Twitter Q&A session at 9 pm EST on Saturday, March 19th Use the hashtag #AskMatsui55 to join the conversation with Matsui’s non-profit organization Twitter handle @M55Baseball. “A new baseball season is right around the corner”, said Matsui, “I am really looking forward to this live Q&A to interact with fans”. Founded last April, Matsui 55 Baseball Foundation, Inc. has hosted baseball clinics for children in New York, Los Angeles and Japan and will host baseball clinics in both the USA and Japan this year again. About Matsui 55 Baseball Foundation, Inc.